Be the first to share your favorite memory, photo or story of Clareen. This memorial page is dedicated for family, friends and future generations to celebrate the life of their loved one. 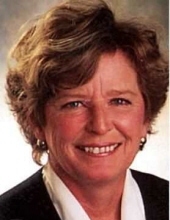 MADISON-Clareen “Clare” (Pingel) Erickson, age 74, peacefully passed into heaven, surrounded by her family and friends on Wednesday, Feb. 6, 2019, at Agrace HospiceCare in Fitchburg, shortly after being diagnosed with cancer. She was born in 1944, in Ashland, the first of three daughters, born to Clarence and Betty Pingel. Clareen graduated from DePadua High School in Ashland in 1962, and Northland College also in Ashland in 1969, with a degree in Social Studies. She moved to the Madison area shortly after graduation and worked in Human Resource Management for various employers, retiring from Econoprint in 2005. Clare married her best friend, Jerry Erickson in 1980. She lovingly gave him the gift of life when she donated one of her kidneys to him in his battle with kidney disease. They celebrated 37 years of marriage before his passing in 2017. Clare will be remembered for her ever present smile, outgoing personality, and eagerness to help others. She was joyful, fun to be with, and enjoyed life to the fullest. She and Jerry were well traveled in the United States, Canada, and Europe. Both she and Jerry came to love the music of Helmut Lotti, attending may of his concerts in Belgium, Germany, and Austria. Clareen will be lovingly remembered and deeply missed by her sisters, Sherry Lowe of Saint Peter, MN and Julie Danula of Lake Nebagamon, WI; many nieces, nephews and cousins; very special life-long friends, Ronni and Bonnie; and numerous “Lotti” Facebook friends. She was preceded in death by her husband, Jerry; and her parents, Clarence and Betty. A Mass of Christian Burial will be held at ST MARY OF THE LAKE CATHOLIC CHURCH, 5460 Mary Lake Road, Westport, at 11 a.m. on Monday, Feb. 11, 2019, with Monsignor James Gunn presiding. A visitation will be held at the church from 9:30 a.m. until the time of the Mass on Monday. Memorials may be gifted in Clareen’s name to Agrace HospiceCare. Clareen’s family wishes to thank the doctors, nurses, staff and volunteers at Agrace HospiceCare for the compassionate care and support they provided to Clareen in her final days. Online condolences may be made at www.gundersonfh.com. "Email Address" would like to share the life celebration of Clareen Ann Erickson. Click on the "link" to go to share a favorite memory or leave a condolence message for the family.